How do you become a better hooper? I mean, I know how to do some stuff. I can do it but not well. Or skillfully. Or is that something that will come in time? Do you do drills? Dedicate an entire hooping practice to practicing that one move? I'm just kind of at a loss. I feel like if I were to google, "how to be a better bellydancer, runner, athlete, etc" I could find answers. Hooping doesn't have that...yet. Should I cross train with other forms of dance to help my muscles or whatever? Help me out here! Since you've became a hooper, have you been thinking of yourself as an athlete? I have. I'm fat and I'm an athlete! whoooooo. I really think this might be the key to losing those last 80 pounds. The way I did first was to accept my body as is. I would think that my body was strong and my calves were powerful even with the flaws. If I'm starting to accept my body as is by hooping, it might work again. I mean would an athlete scarf down an entire box of cookies? Nope. An athlete would at least pay attention to portion sizes. The thing is I need something to prevent my thought process from thinking: You can't hoop because you aren't like those skinny hoopers. This is hard for you because you're fat. You have to use that huge hoop cause your round. Although good news: I'll be able to have more videos of my home practice. I have a new webcam that takes videos. I think I need to get back on the 30/30 bus with changes. Ie, on my double days or something, I have to do at least 10 minutes but if I'm about to die, it's cool not to reach 30/30. And more good news: The lady who let me use a hoop that showed me that I COULD hoop is having two hoop classes. Yay! Hoop classes! Plus old friends will be there. Although husband doesn't even like the idea of me going to it. I don't get it. 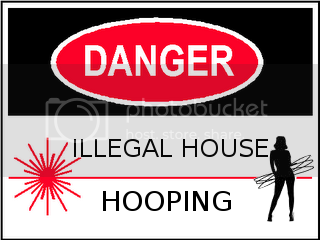 What is so wrong with hooping classes? I'll actually have $10 for it anyways! I want to bash his head in with my heavy hoop. Maybe then he'd get it. When I discovered hooping, I was on a 4 month break from work, so for me, I feel like I was given a leg up in opportunity, because I could watch tutorials and practice for 6 hours a day if I wanted. Now that I'm back to work, I only hoop on weekends, or for 30 second bursts here and there while dinner is cooking or waiting for my husband or something. If I found the hoop while working, there's no way I would have learned everything I have so far. And working as much as you? Forget it, hehe. I dunno, I think drills are helpful, but they get frustrating especially if it's a move you are finding more difficult. Sometimes you have to let it go and come back to it next month. I think it's time put into it, and the effort. But mostly time. The Hoop Path has that term "flight time"... someone can hoop for 3 years but only hoop twice a month. Someone else can hoop 3 months every day for 8 hours a day, and can have more experience and more mastery and control over the hoop. I think the same can be said about running or athletics... if we want to be better hoopers, we have to dedicate ourselves to it. Talented pianists don't just wake up one day with skill. Marathon runners don`t get the stamina from a few laps around the block. I think my motto is to eat healthily, hoop up a sweat, have fun, and be determined about it at the same time. You`ll see a lot of advice to follow your hoop and let it lead you in movement.. that doesn`t work for me. I`m too calculated. Maybe it`s a good thing there is no easy answer on how to be a better hooper, because we can approach it individually and end up where we want to be without looking like everyone else in the process. It truly makes it something we can own. Another thing I would add to Shekinah's thoughtful comment would be that these feelings of "ruts" or like you aren't improving are totally normal. I feel like after some of the initial, "hey this is cool!" wears off and you have a few moves down it can be like, well, what's next? With the hoop community growing - and AMAZING hoopers popping up everywhere it can feel as if EVERYONE is incredible and how on Earth did they get there? In the earlier phases of my hoop practice drills did NOT work for me - that is, if I thought of them as drills. I would try to learn something and keep doing it over and over - but, if I was really angry - I walked away. It's always still where it was and you can go back to it. The most helpful thing is something like the 30 Day Hoop Challenge because then you are hooping everyday - which, I think is a great way to improve. Just making part of daily life. Time constraints can make that rough, but it's great that you are signing up for classes and trying to get more time in that way. So true about comparisons!! Sometimes I spend far too much watching and re-watching hooping videos.. I could be a much better hooper if I got up off the computer and actually HOOPED. I don't improve by being jealous.. I gotta work at it!